"Marcia Falk is a vital voice for our times. Her brilliant work is bound to touch your heart, open your mind, and bring a new sense of the ancient power of the High Holidays. She seamlessly weaves a poet’s gift for words that open inner vistas, a liturgist’s capacity to speak to the universal, a scholar’s insight into Jewish traditions and texts, and a contemporary feminist’s fresh vision. This book is a wonderful companion for the Ten Days of T’shuvah." The Jewish High Holidays—the ten days beginning with the New Year Festival of Rosh Hashanah and culminating with Yom Kippur, the Day of Atonement—constitute the most sacred period of the Jewish year. During this season, religious as well as nonaffiliated Jews attend synagogue services in unparalleled numbers. Yet much of what they find there can be unwelcoming in its patriarchal imagery, leaving many worshipers unsatisfied. 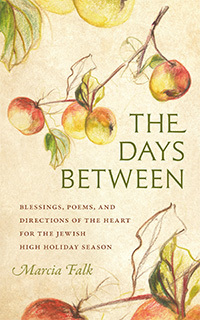 Accessible and welcoming to modern readers, The Days Between is steeped in traditional sources and grounded in liturgical and biblical scholarship. It will serve as a meaningful alternative or supplement to the traditional liturgy for individuals, families, synagogues, and communities small and large—that is, for all who seek fresh meaning in the High Holidays. "Marcia Falk has captured the essence of our ten Holiest Days—a journey from reflection to renewal to resolve. Her exquisite poetry and prayer will speak to the contemporary seeker looking for language that opens the heart and soul. Not just American Jews but the many Israelis who are estranged from traditional Hebrew prayer will be drawn into this inviting, wonderfully usable guide and precious companion for the very days that cry for a new rite of passage."